The kantha is a work of art that illustrates the patience, craftsmanship and resourcefulness of the rural Bengali woman. Born out of thrift, it converted the recycling of old used cloth into an extraordinary art form, yet serving a variety of functional purposes. It was also a reflection of the devotion of the women folk towards their families. This unique art form has existed for centuries and the earliest reference to it has been found in Sri Sri Chaitanya Charitamrita, written by sixteenth century Vaishnav poet Krishnadas Kaviraj Goswami. Kanthas were made by sewing together several layers of old and discarded cotton saris (worn by the women) or dhotis (worn by the men), using close running stitches across the entire piece to hold the layers in place. A line diagram of the overall design would then be marked out with a needle and this was then filled out with threads of many colours. The multi-coloured stitches followed a complex and integrated pattern, skilfully concealing the joints. All blank spaces would be further covered with small stitches giving the ground of the kantha a characteristic rippled appearance. The thread used to stitch the layers together and embroider the ground would always be drawn from the borders of old sarees. Borders of old sarees were torn out and kept aside especially for this purpose. Often the entire kantha would be encased by the border of a saree. The earliest and most basic stitch found in kanthas is the running stitch used on the ground as well as around motifs to create the unique rippling wave like effect. 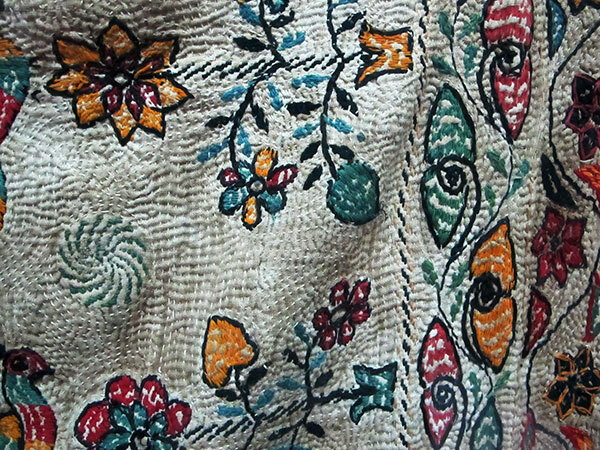 Although a variety of embroidery stitches are now used in kantha motifs, early kanthas used only variations of the running stitch. Traditionally, kanthas were chiefly made for the family’s personal use as handkerchiefs (rumal), pillow covers (oaar), covers for hand mirrors and combs (arshilata), small bags (durjani), wraps (beton) to tie up books or valuables, quilts (lep) for the winter and bed spreads (sujni). The term Nakshi Kantha (naksha means embroidery) is a latter-day adoption. It began to be associated with richly embroidered kanthas, only after the famous folk poet Jasimuddin brought focus on this village craft through his exquisite poem, Nakshi Kanthar Math (1929). 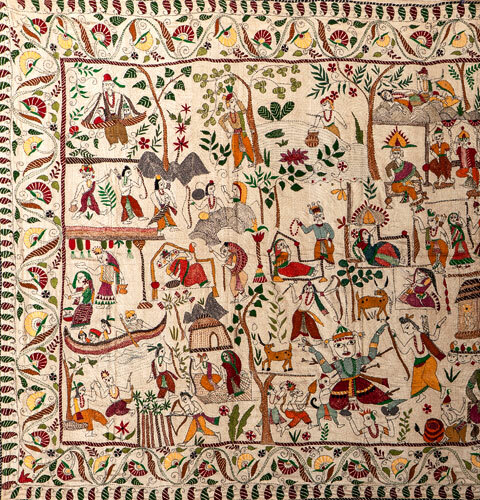 Kanthas were embroidered by the women in their free time. The rougher the use of the kantha, the less intricate was the embroidery – care being given instead to securing strength through the stitches. The highly decorated sujni kanthas used to be gifted to daughters at their weddings. A particular style of stitching was the Dorokha – two sided or reversible. 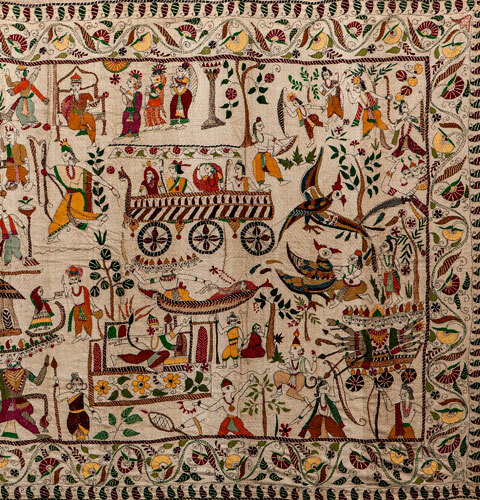 The embroidery was so skilfully done that it appeared identical on both faces of the kantha. The kantha artist, the Bengali village woman, never repeated a design nor copied an existing design. It was a point of honour. Truly exquisite designs closely allied to the alpona (a Bengali folk design mainly done by the women folk of Bengal) drawings are embroidered on the nakshi kanthas. The early kanthas had a white or near white background accented with red, blue-black and yellow embroidery; later other colours were also included. 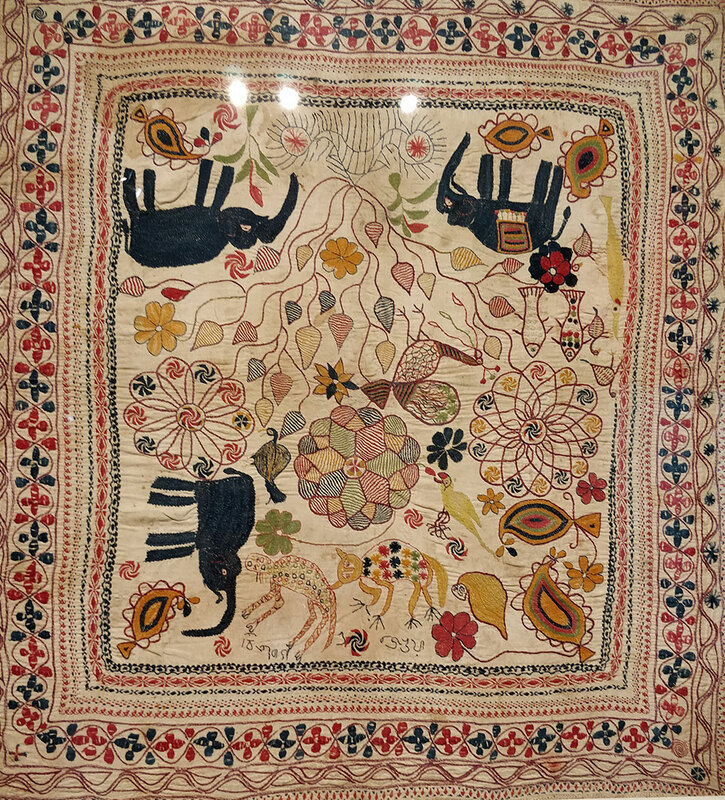 The most traditional motif employed is that of a blooming lotus within a mandala, in the centre of the kantha surrounded by floral, animal, human or geometric folk motifs. The mandala is a concentric circular motif that has religious and spiritual significance in Hindu and Buddhist iconography. The nakshi kanthas, in their own way, depict the social and personal lives of these women.  The motifs that appear are often taken from items of everyday domestic use like earthen pots, rice bowl, betel-box, pitcher with spout, umbrella, scissors, mirror and comb; images of animals and birds as well as human figures like that of milkmaids, fisher women, horse riders etc. The artists borrowed from epics and legends too and often stamped their work with their individuality by incorporating their names or a sentence or a verse. The kanthas created by Muslim women (in undivided Bengal and Bangladesh today) focused on geometrical designs and floral motifs. The old and highly decorated nakshi kanthas have now become collectors’ items. Kanthas today are produced commercially and have flooded the markets of West Bengal, with the infusion of new materials, designs and stitches and applications. In fact, the term kantha today is often mistakenly identified as a particular kind of stitch. At any rate, the result of commercialization is that rural women have lost control over the craft and the kantha is no longer a unique, individual piece. They now produce on a mass scale, catering to specific demands made by urban designers and traders and by an urban upper middle class clientele. No longer serving its original functional purpose, it is the the kantha "look" that is being replicated on saris and even yardage. Thus, traditional motifs and styles of stitching that typified kantha are giving way rapidly to urban designs. 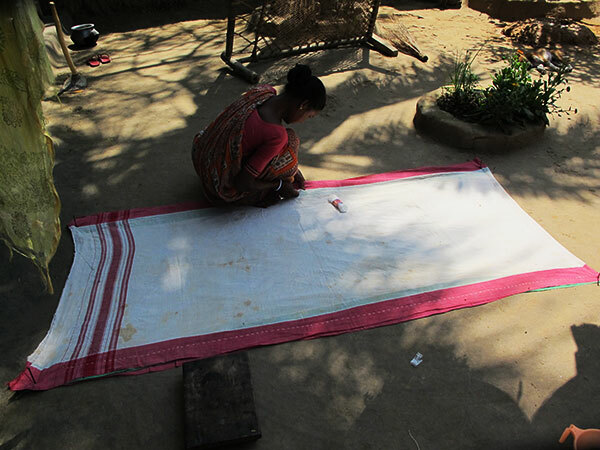 What’s more, the kantha artists only receive a mere fraction of the huge profits. However, the art does not run the risk of dying. While also sold commercially, there is another category of kanthas. Mainly sujnis, these have been recreated using traditional patterns. The trend started sometime in the seventies when artistically talented and enterprising women inspired by the earlier kantha revivalists of Santiniketan started designing kanthas for team work and made room for a great economic activity for the West Bengal women. The first person to start this trend was the late Srilata Sarkar. The main difference between these "collaborative" kanthas and the older ones is that the cloth used is new, not recycled and that the final output is regulated and contrived and no longer representative of the individual artistry of its maker. Some experts are of the opinion that Nakshi Kantha was, in the main, an art form that flourished in the areas along the course of the river Padma – more so in the districts on the eastern banks in present day Bangladesh and less on the western banks covering Murshidabad, Nadia, Malda, North 24 Parganas in West Bengal. Nakshi kanthas showcased in museums across the world are from this kantha zone. Closer to home, and comparatively of more recent vintage (1930s onwards), the Gurusaday Museum in Kolkata has a collection of more than two hundred kanthas. The Ashutosh Museum and the art gallery of Ananda Niketan (both in Kolkata) also have a large collection of kanthas.